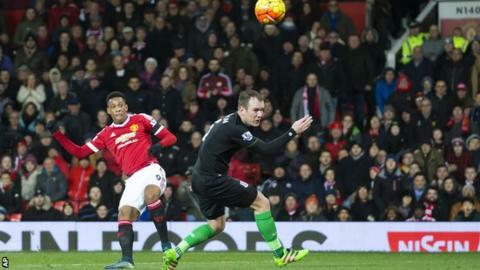 Manchester United kept in contention for a top-four Premier League place and gave manager Louis van Gaal a rare night of relaxation as Stoke City were outclassed at Old Trafford. Van Gaal and his players were jeered after defeat by Southampton in their previous home game - but it was all a sharp contrast here as United, inspired by youngster Antony Martial, won at a canter. Jesse Lingard headed in Cameron Borthwick-Jackson's perfect delivery after 14 minutes to end a shocking sequence of 11 matches without a first-half goal at home stretching over a period of eight hours 40 minutes. Martial scored the goal his performance merited with a fine curled finish shortly after before setting up the third for Wayne Rooney from close range eight minutes after the break. It was a win United's performance fully deserved and the victory margin could have been even greater, leaving them in fifth place, five points behind fourth-placed Arsenal. As Manchester United have struggled through this colourless, painful season there has been one shaft of light offering real hope for the present and the future. Anthony Martial's £36.5m signing from Monaco, when he was only 19, in September was regarded as a gamble by Van Gaal. On this night of rejuvenation at Old Trafford it looks even more like money well spent. The wisdom is that the rangy youngster will end up playing as a central striker, but Van Gaal has used him regularly from wide positions and, stationed on the left flank here, he tortured Stoke's defence and made former England defender Glen Johnson's night a misery. He showed all the pace and athleticism that will be an asset to United for years to come as he was a threat all night, showing wonderful technique and composure to curl in a right-foot shot for the second goal then showed calmness and vision to lay the third on a plate for Rooney. It was his sixth goal and third assist in the league, with the promise of plenty more to come. He departed to a deserved standing ovation with 11 minutes left. Some of United's work in the transfer market since the departure of Sir Alex Ferguson has been justifiably criticised - not a bit of it with Martial. Manchester United's 64-year-old manager has been a besieged figure this season, seemingly facing a crisis and an uncertain future on a weekly basis, scrutinised once more on Monday when neighbours Manchester City announced the world's most coveted coach, Pep Guardiola, would be joining them in the summer. He received a subdued welcome as he made his way down the Old Trafford touchline to his technical area before kick-off, acknowledging a smattering of applause with a couple of waves. Van Gaal was able to make the return journey at the final whistle with cheers ringing around Old Trafford after their most impressive performance in months, a display designed to support his theory that things will eventually get better. It has been a good few days for Van Gaal, with a potentially hazardous FA Cup fourth-round trip to Derby County safely negotiated last Friday and now this convincing victory. When Lingard stooped to head in Borthwick-Jackson's superb cross after 14 minutes, the roar that went around Old Trafford was tinged with relief and delight. How United and Van Gaal needed that. The first groans of frustration had surfaced moments earlier when Chris Smalling drove into Stoke City's half but lost momentum because of lack of movement from his team-mates - but the pressure valve was released by Lingard's goal. Old Trafford was in buoyant mood for the rest of game, United's supporters able to sit back and enjoy their team exerting total control and playing with a fluency rarely seen this season. Manchester United boss Louis van Gaal: "I think we have played in the first half attacking- wise very good. In the second half we were more controlling and we didn't give any chances away against a team like Stoke. That is remarkable because they always make it difficult." Stoke boss Mark Hughes: "We didn't start in the right manner. We conceded early on, were too passive and for the first goal we didn't get close enough to people. Avoiding going 1-0 down early on is what you talk about before coming to Old Trafford, and unfortunately we conceded another poor goal for the second." Manchester United travel to Chelsea on Sunday (16:00 kick-off), while Stoke host Everton on Saturday (15:00 GMT). Match ends, Manchester United 3, Stoke City 0. Second Half ends, Manchester United 3, Stoke City 0. Wayne Rooney (Manchester United) wins a free kick on the right wing. Substitution, Manchester United. Ander Herrera replaces Marouane Fellaini. Substitution, Manchester United. Memphis Depay replaces Anthony Martial. Attempt missed. Wayne Rooney (Manchester United) right footed shot from outside the box is just a bit too high. Assisted by Anthony Martial. Attempt missed. Glen Johnson (Stoke City) left footed shot from outside the box misses to the right. Offside, Stoke City. Erik Pieters tries a through ball, but Peter Crouch is caught offside. Attempt missed. Phil Bardsley (Stoke City) right footed shot from outside the box misses to the left. Assisted by Glenn Whelan. Corner, Stoke City. Conceded by Michael Carrick. Offside, Manchester United. Cameron Borthwick-Jackson tries a through ball, but Anthony Martial is caught offside. Substitution, Stoke City. Stephen Ireland replaces Bojan. Phil Bardsley (Stoke City) wins a free kick in the attacking half. Attempt missed. Anthony Martial (Manchester United) left footed shot from the left side of the box is too high. Assisted by Wayne Rooney.